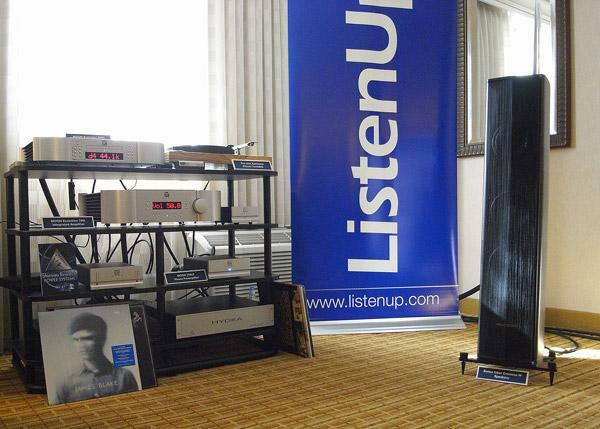 Colorado retailer Listen-Up's B&W and Classé room offered a surprisingly full-bodied sound from the small B&W PM1 speakers ($2800/pair), driven by a Classé CA-2300 amplifier and CT-P800 digital preamplifier via AudioQuest cables. 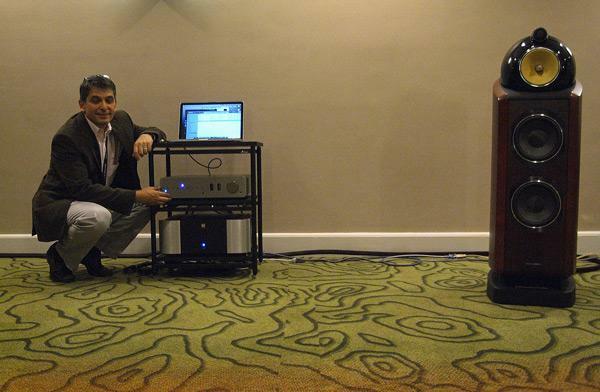 But if you closely, you can see one of the almost-as-tiny B&W PV1 subwoofers ($1500 when last available) fleshing out the low bass. 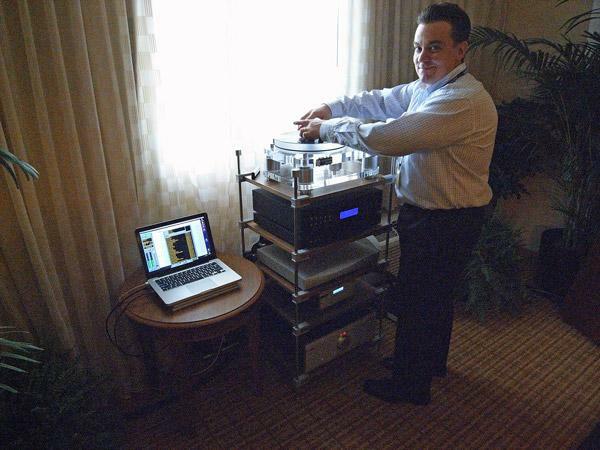 Visitors to the room were encouraged to play their own recordings on the Mac mini that was acting as a server sending asynchronous USB data to the CT-P800. 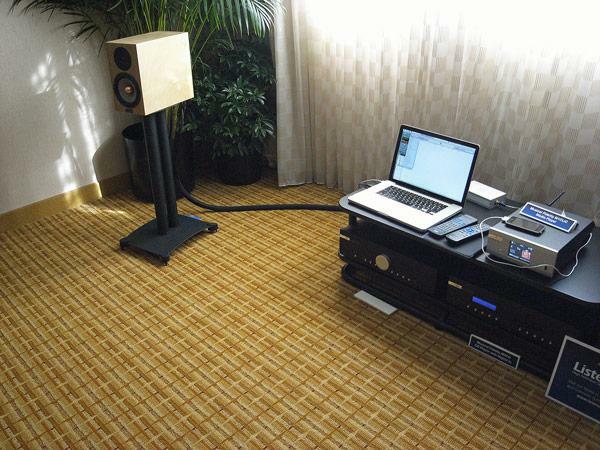 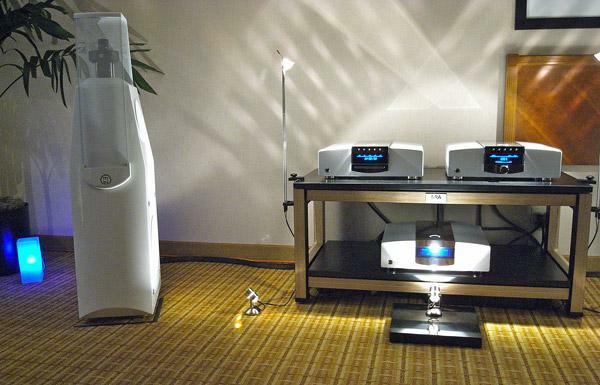 The 2011 RMAF saw the debut of MBL's new Corona series, all finished in gloss white. 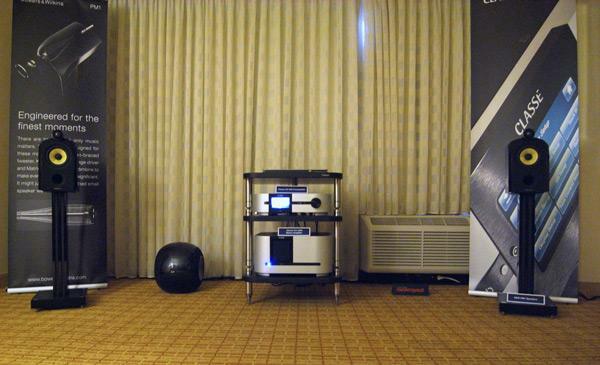 Playing Peter Gabriel's new CD of some of his songs abut accompanied by a orchestra, the C31 CD player ($9200) and C51 300Wpc integrated amplifier ($11,100) sounded open, spacious, and uncolored with the new MBL 116F "Radialstrahler" loudspeaker ($32,000/pair). 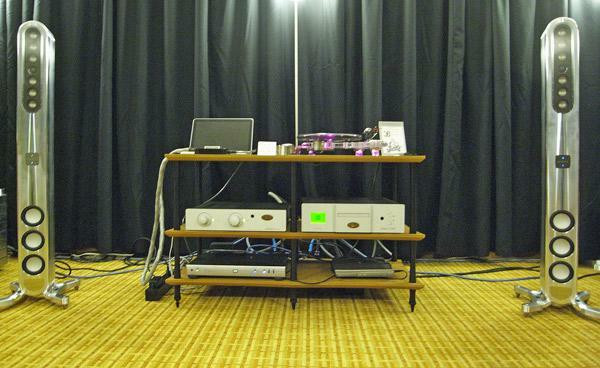 My kind of style in the Music Hall room, where the featured system came in at under $4000: Music Hall’s new a70.2 integrated amplifier ($1499), MMF-2.2 turntable ($449) with Cruise Control 2.0 power supply and speed control ($299) and cork record mat ($50), a15.2 CD player ($499), the new DAC15.2 ($299), and Epos Epic 2 loudspeakers ($799/pair; see our reviews in the November and December issues). 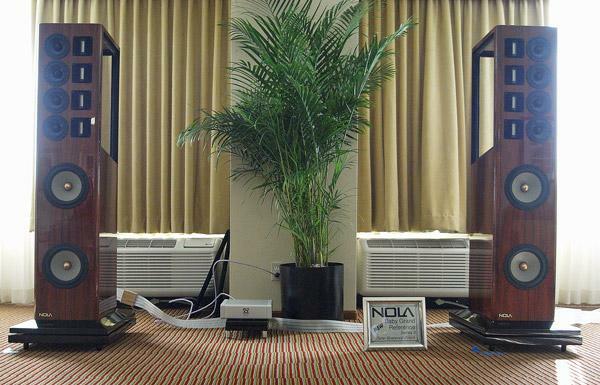 A large name for a large loudspeaker, Nola's Baby Grand Reference Series II, which combines four Raven ribbon tweeters with two 9" magnesium-cone woofers and four proprietary 4.5" midrange units, was being demonstrated with Audio Research Reference 250 amplifiers and front-end, Nordost cables, a QX4 system conditioner, and a Silver Circle Pure Power One 5.5 AC isolation transformer. 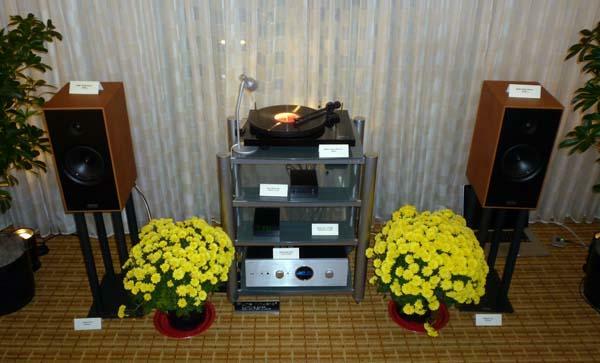 Like many rooms at this year's RMAF, a Billie Holiday track was playing when I went into the Nola exhibitin this case, "Lover, Come Back to me"and even in mono, the sound was immersive. 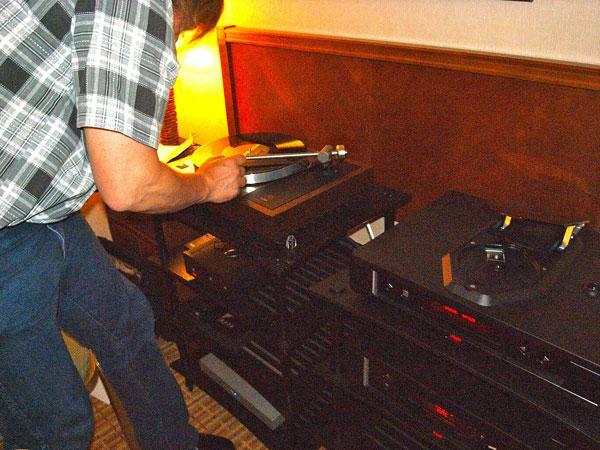 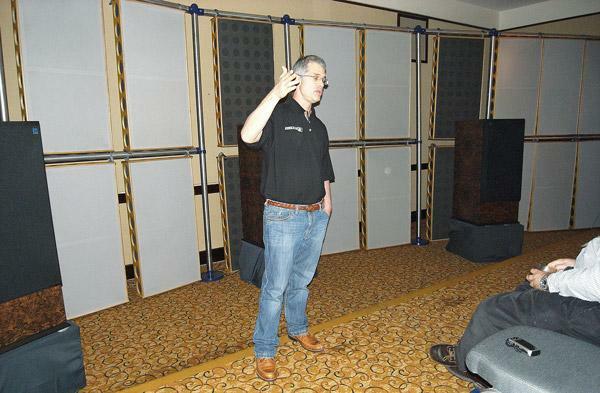 The Show speakers had an attractive piano-gloss rosewood finish and they featured the 3.5-way Unison Xtreme Crossover System, implemented on three separate boards and integrated into the speakers themselves. 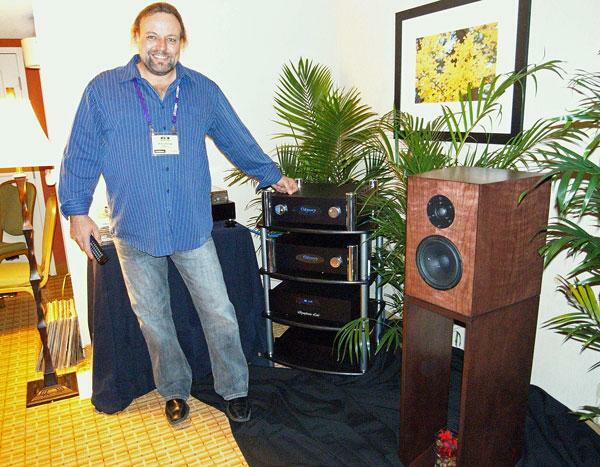 The speaker's price of $55,000/pair will be maintained until the New Year, when they will rise to $58,000/pair. 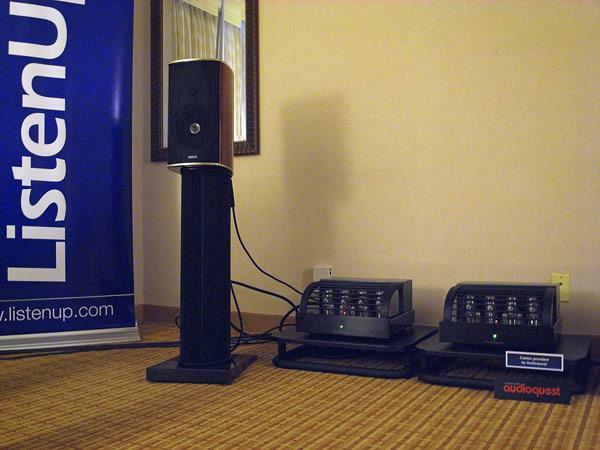 There was a lot of buzz over the new high-performance, highly versatile Invicta DAC/preamp ($3395) from Resonessence Labs. 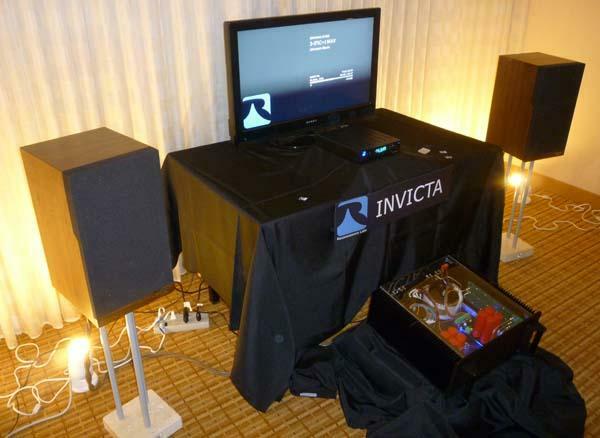 The Invicta handles all resolutions up to 24-bit/192kHz from all of its inputs, including asynchronous USB 2.0.